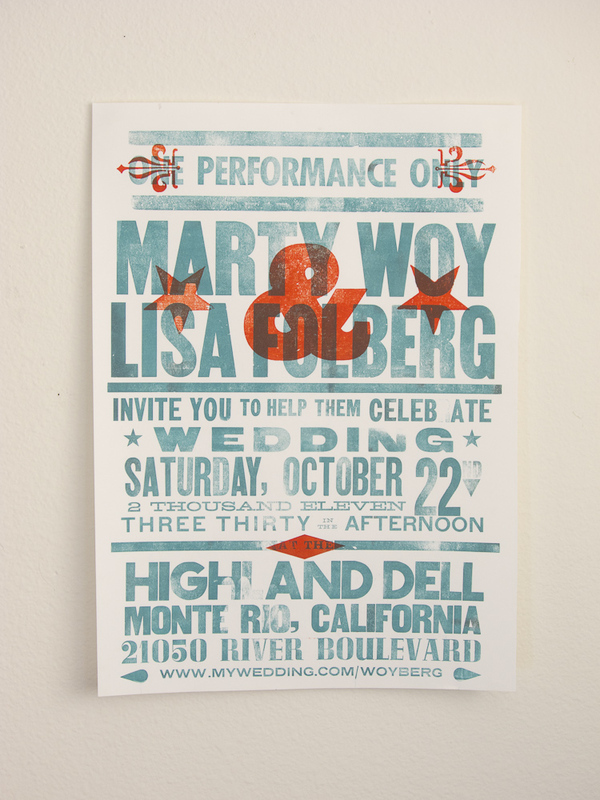 Lisa Folberg contacted us to discuss options for producing a set of creative, limited-run wedding invitations. 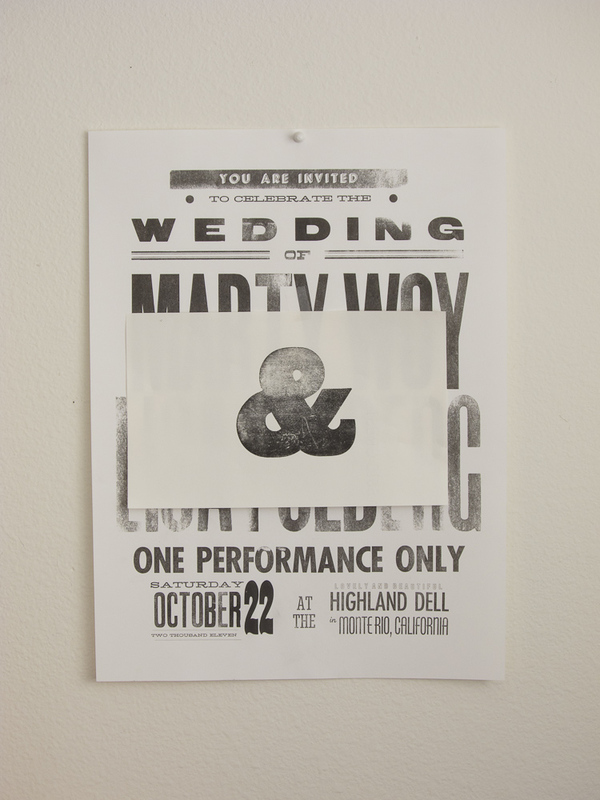 She had seen the invitations that Alyssa and I had done for our own wedding and was inspired to do something similar. 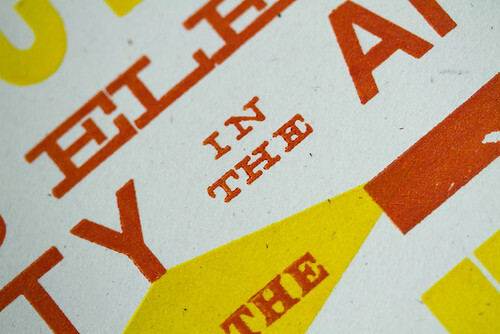 Now that we had our connection to the International Printing Museum, it made perfect sense to create letterpress prints. 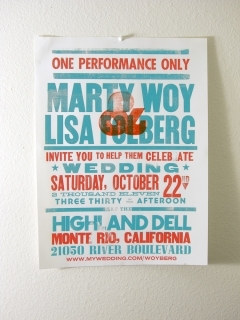 With an intimate guest list, the desired quantity was very small. We therefore decided that using the museum’s collection of antique wood and metal type would be a perfect way to avoid the extra expense of creating multiple plates, while also adding a level of charm and history that would be unachievable with a computer. 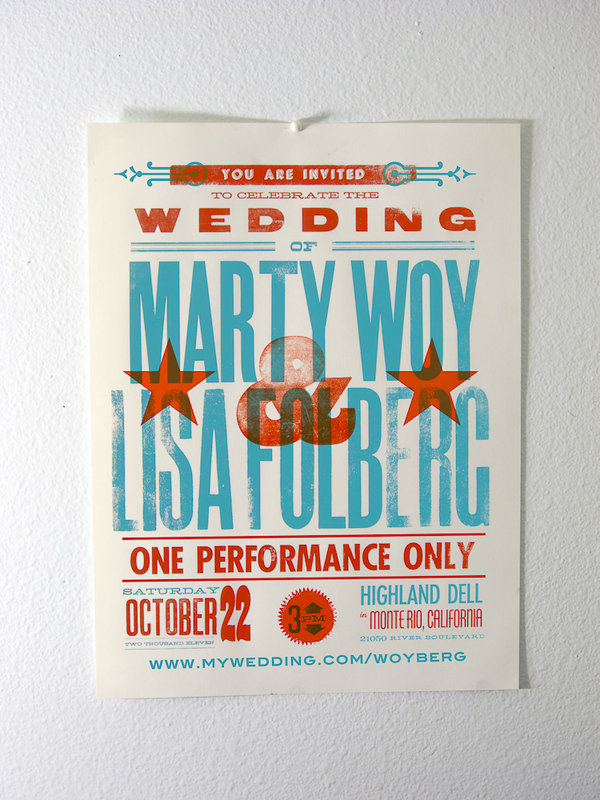 And since Lisa and Marty were feeling adventurous, it would also allow us to create a poster as large as the bed size of the museum’s Vandercook proof presses. The design process was intense. 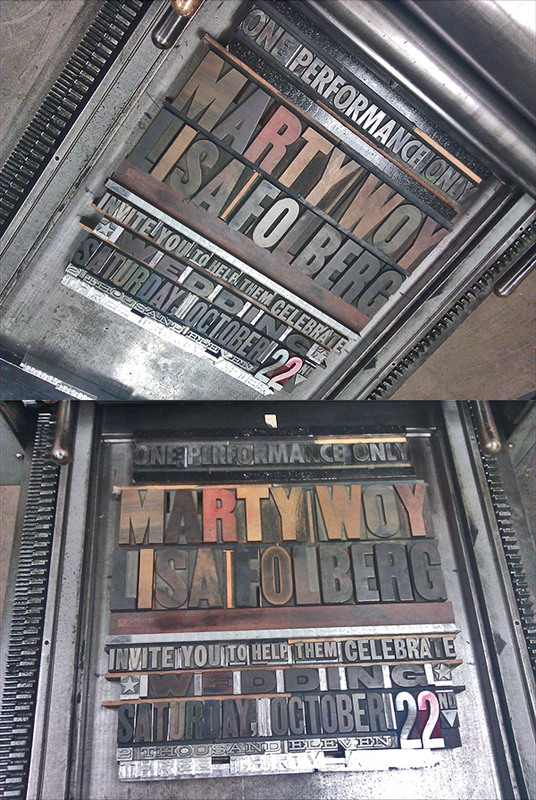 Working with Lisa’s text, we experimented with various sizes and styles of wood and metal type. It’s obvious to anybody who has worked in the analog why this is challenging compared to working with a computer: there are only limited numbers of letters available, and there’s no way to scale, overlap, etc. Frequently, we would typeset most of a line and realize at the very end that we had run over the amount of space we had available. When the first draft was finally complete, we proofed it in black, knowing that we would eventually need to split the forme into separate lockups to run two colors. 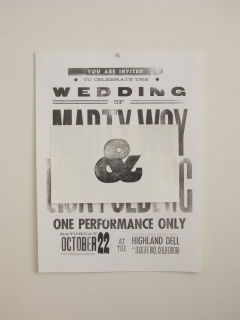 Proofs, set up for clever Photoshop work. Proofs after being colorized and layered digitally. After sharing the initial proof with Lisa, revisions were necessary, and we essentially started the entire process over from scratch. The second layout was approved, and using a combination of analog and digital processes, we were able to experiment with color options before our final run. Photoshop-colorized proofs, mocking up color separations. Photograph of actual two color proof, prior to color separating text. We had chosen two colors of the French Speckletone for our paper stock (Madero Beach and True White). (See swatches here.) We ran some on Madero Beach and some on the True White. The speckled nature of the paper added another interesting dimension to the piece—it looks great up close, especially in person. After final approval of colors, we prepared to do our run on a weekday evening. 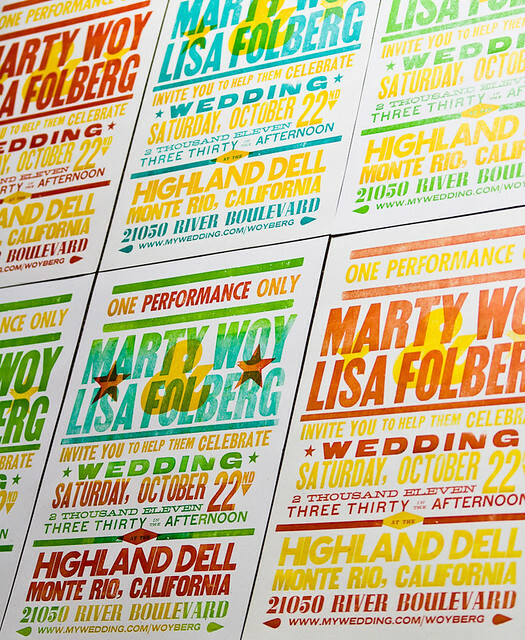 During the run, which lasted us many hours, we decided to hand ink every single poster to create an assortment of colorways without having to keep washing up the presses. 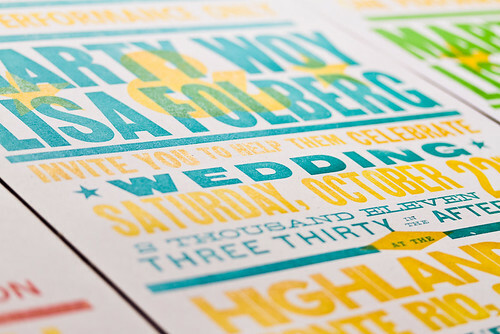 We devised three main colorways, and then at the very end, around 4:00AM, Alyssa decided to get crazy and ran a small handful of “special edition” prints with a multicolor look, achieved by hand inking the forme in specific areas. 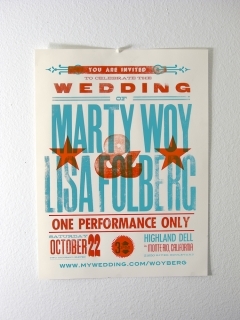 Lisa and Marty were very happy with the outcome, and even wrote about the invitation creation process on their wedding site. 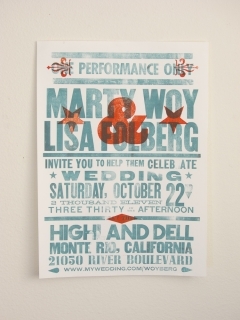 They’ll be displaying the posters at the wedding, and I’ll post photos of them in use in a few months! These are really beautiful. 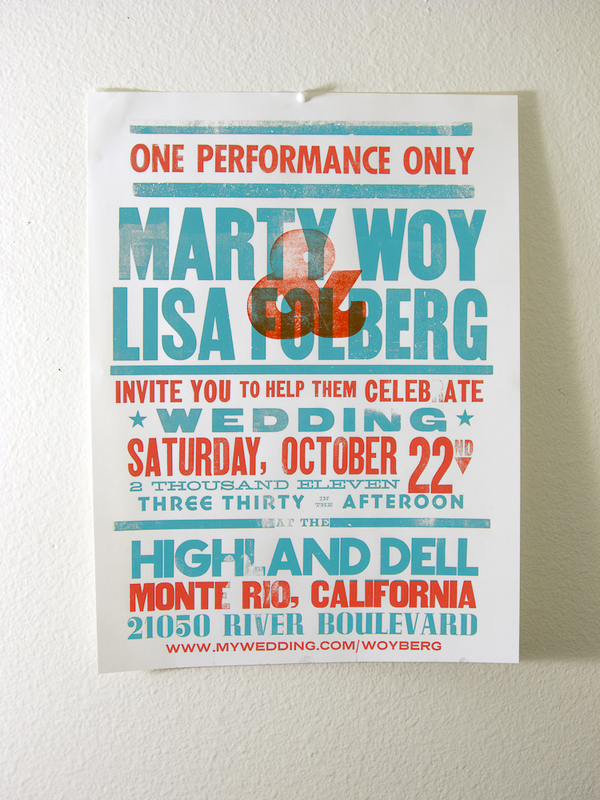 They playfully suggest concert announcements and boxing posters, making the invitation look like celebratory fun, rather than like a formal announcement of a life sentence.